FULTON, NY – Youth in the Fulton School Mentoring Program were recently treated to lunch from the Jungle CafÃ© at the Rosamond Gifford Zoo in Syracuse, compliments of Fulton Savings Bank. 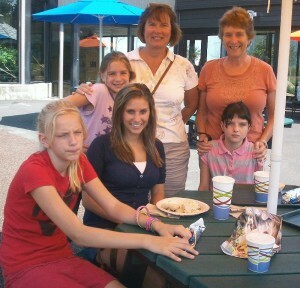 Fulton Savings Bank recently treated youth in the Fulton School Mentoring Program to lunch at the Rosamond Gifford Zoo in Syracuse. In front from left are: Kristeen Hess, Jordan Tetro and Kristina Bowman. Standing from left are: Marissa Katura along with Nancy Kush Ellis and Wendy Tetro of the Fulton Savings Bank. Fulton Savings Bank vice president/marketing and human resources Nancy Kush Ellis and senior vice president/controller Wendy Tetro serve as mentors in the program and recently participated in the zoo field trip. Kush Ellis, who has been involved in the program for almost a year, will reach her one-year match anniversary in November. Tetro has been involved with the program since fall of 2006 and has given the program almost 100 hours of volunteer time. She currently is meeting with a youth from Volney and they will celebrate their one-year match anniversary in October. Special thanks to Fulton Savings Bank for their wonderful support! The Mentoring Program matches adult mentors with Fulton youth ages 8-15 and is a collaboration between Oswego County Opportunities, the Fulton Community Task Force, Catholic Charities of Oswego County and the Fulton School District. If you would like to be a mentor or refer a student, call Carol Ireland, program manager at 402-2093. The Fulton School Mentoring Program is fully funded by a DCJS grant and serves youth in the Fulton School District.